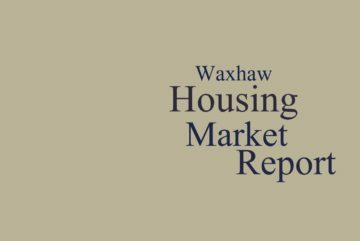 Waxhaw Housing Market Update for March 2019. The Waxhaw area of the Charlotte, North Carolina metro area (the 28173 zip code–encompassing the three towns of Waxhaw, Marvin and Weddington) continued to see tight inventory coupled with a double digit decrease in new listings year-over-year, impacting sales negatively. On the positive side, pending sales improved by double digits compared with the same time period one year ago. Days on market, both average (also down by double digits) and median, were lower compared with March 2018. 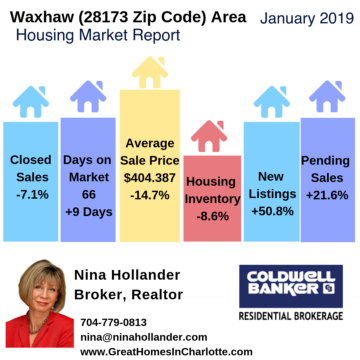 Waxhaw Housing Market Update for February 2019. 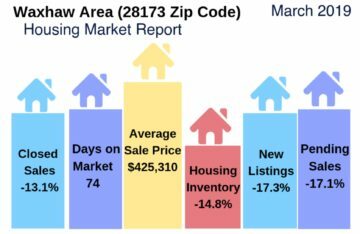 The Waxhaw area of the Charlotte, North Carolina metro area (the 28173 zip code–encompassing the three towns of Waxhaw, Marvin and Weddington) continued to see tight inventory and no increases in new listings impacting sales negatively. The months supply of homes in February decreased by almost a full month since January 2019. While closed sales were down 20% overall, closed sales of resale homes were down only 2%. Days on market continue to decrease in 2019. New construction homes continue to carry a big premium over resale homes, selling at about $77,000 more per home on average. November 2018 home sales in the Waxhaw area of the Charlotte, North Carolina metro area (the 28173 zip code–encompassing the three towns of Waxhaw, Marvin and Weddington) continued the trends we’ve seen all year. Home prices increased substantially in November. Inventory remains low, especially in affordable homes. New listings were down double digits in November. New construction sales remain a driving force in the Waxhaw area housing market. The Waxhaw/Weddington/Marvin areas housing market remained a seller’s market in October 2018, suffering from a distinct lack of affordable, resale homes with average home prices now in the mid $400,000’s. New construction remains a driving force in the 28173 zip code, further driving up average and median home prices. The Waxhaw/Weddington/Marvin areas housing market remained a seller’s market in August 2018, suffering from a distinct lack of affordable, resale homes with average home prices now in the high $400,000’s. New construction remains a driving force in the 28173 zip code, further driving up average and median home prices.